VW's first SUV gets a tongue-twisting controversial name, but what's behind the badge fares much better. 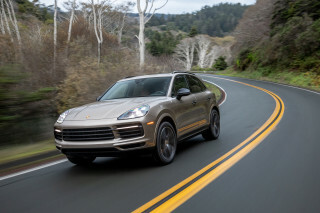 Porsche has extended the Cayenne SUV range with a 3.2-liter V-6 power unit and a six-speed manual gearbox that will also be available in the V-8 version. The engine is sourced from VW, where it is used in a number of high-performance sedans as well as the entry-level Touareg SUV. In a manner reminiscent of the way Jaguar refers to its Ford-born power units, Porsche is at pains to point out that the unit in the Cayenne is heavily modified to make it fit to appear under a Porsche hood. The changes include a new intake system developed by Porsche, that significantly increases both power and torque. In a Touareg, 3.2 liters of VW power will give you 220 hp at 6400 rpm and 225 lb-ft of torque at 3200 rpm. After the specialists at Zuffenhausen have had their way with it, the Cayenne’s V-6 is good for 250 hp at 6000 rpm and 228 lb-ft, starting at 2500. The Porsche version has more than 220 lb-ft available from 2000 rpm to 5500 rpm, a useful attribute in an off-roader. The extra power shows in the Cayenne’s performance; whereas the Touareg has a top speed of 125 mph, the Cayenne goes on to 133. Acceleration is faster too, with the Porsche reaching 100 km/h (62 mph) in 9.1 seconds against the 9.9 of the VW version. This is essentially a system that holds the vehicle on a hill without the need to apply the parking brake. The system senses when the vehicle stops on a hill and when the foot is removed to operate the clutch maintains the braking force applied by the pedal. When the clutch is engaged, the brake pressure is released and the vehicle moves off. The system works in both forward and reverse, and it enables Porsche to use a foot-operated parking brake without the problems posed to even the most expert drivers when trying to parallel-park on an incline with this type of system. 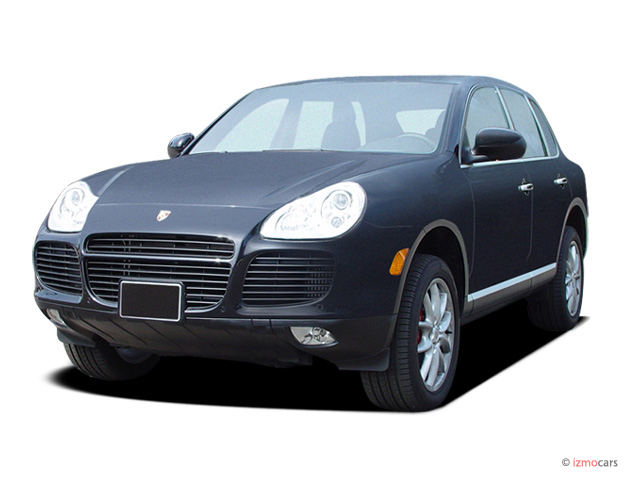 Traditionalists will have problems adapting to the system at first, however, because the designers have given the Cayenne a grab-handle on the center console that is shaped just like a conventional hand-brake lever. As a European, less used to foot-operated parking brakes, I reached for the grab-handle rather than the parking brake release more often than not during six hours in a Cayenne. But that’s a European quibble — the Drive-Off Assistant was faultless. We tried the new Cayenne in Finnish Lapland, a few miles north of the Arctic Circle, in a climate that enabled us to check the efficiency of the all-wheel drive in low-grip conditions, on forest roads and highways, and no-grip conditions, on wide expanses of snow at an arctic test-complex. The complex owes its existence to the fact that Rovaniemi, the closest town, has become a center for the European automobile industry to test its products under extreme winter conditions. On the snow-covered gravel of the forest roads, the Cayenne was sure-footed and safe, although any deviation from the established wheel-tracks of other traffic into fresh snow brought that feeling of twitchiness that all drivers in Detroit and other snowy areas know only too well. It was a mental thing, however, for there was always confidence that the Cayenne could keep its grip and keep plowing on — it was just that first instant when the wheels went off-piste that tweaked the nerve-endings. At the test track, however, the wide-open spaces gave the opportunity to check out the various methods the Porsche engineers have developed to keep a car going where it is pointed, even on the slipperiest of surfaces. Most impressive was the vast circular skid pad, where we had the opportunity to test the “Porsche Stability Management” and “Porsche Traction Management” systems. Working together, the two orchestrate the efforts of a multi-plate clutch that splits drive between front and rear wheels and the traction-control system, which plays with power delivery from the engine and braking on individual wheels. The result is that the car can control itself better on slick surfaces than the driver can. With the system in action, it was possible to apply more throttle than was sensible while the Cayenne’s electronics balanced power and grip against steering angle to maintain steady progress around the circle. Without the outside help, the same style of driving was rewarded only with a spin. It was interesting that at the extreme, the control systems did more than just keep the Cayenne going in the right direction — they also made a great deal of extraneous noise, reminding the driver that this was not the most sensible driving style. The traction management system was also useful on an off-road course that meandered through trees and across some pretty rough terrain. Deep snow will stop even the most accomplished SUV and driver, but the four to five inches on the test track was no obstacle to even an inexperienced off-road driver. An impressive feature of the advanced off-road package that is available as an extra on the Cayenne is a switch that detaches the anti-roll bar. An anti-roll bar is a must for the kind of highway performance demanded of an SUV, but it is a hindrance in extreme off road operations, where the wheels on an axle need to be independent of each other rather than linked. With the roll bar inoperative, the Cayenne was able to cross a Vee-section ditch some two feet or more in depth without problems, cocking first a front and then a rear wheel some two feet in the air in the process. Judging by the Finnish experience, the V-6 Cayenne (recognizable by a black ‘Cayenne’ badge on the rear that distinguishes it from the ‘Cayenne S’ and ‘Cayenne Turbo’ badges of the V-8 versions) is amply equipped for most purposes. It will tow up to 3.5 tons, it has very respectable performance, good if not outstanding fuel economy (17.8 mpg composite, 20.8 highway) excellent interior trim levels and build quality and the Porsche name on the hood. Sales will start in the U.S. early in 2004 at prices yet to be set. Looking for a different year of the Porsche Cayenne?